You are currently browsing the tag archive for the ‘Oasis’ tag. 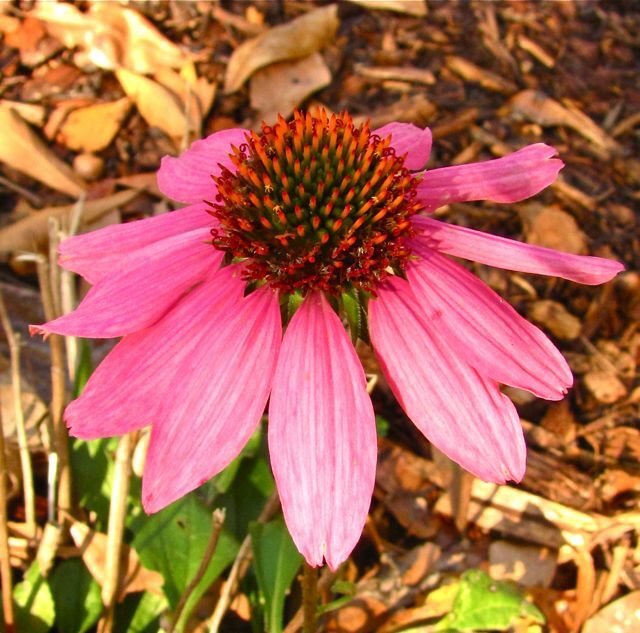 The purple coneflowers have long since given up their blooms, all except this solitary lady, a firecracker of color in a blanket of fallen leaves. I transplanted her and some others a month ago with great emotional fanfare, releasing them from pots where they’d been captive for three years. I put them in the ground on my new property, just outside the dwelling I’m preparing for myself. Imagine my delight when, shortly after planting, this one stood straight up, announcing herself with pink petals and orange center. Each time I visit I am surprised at this tiny oasis of color in a landscape of quiet tans and browns. Surely, I’ve thought, the frosty nights would stop her show. But, no. Three weeks, now, and here she is today, still standing, an unlikely protester going against the odds. The gutsy pink and spikey orange give me a boost of spiritual muscle, a little something to help keep me going as I struggle through the challenges of this season of my life.